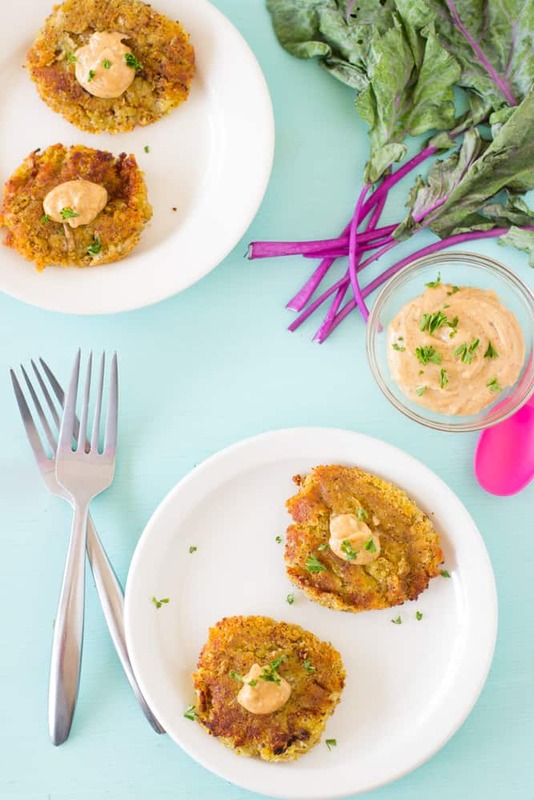 Sweet Potato and Kohlrabi Fritters with Yogurt-Tahini Sauce is a farmer’s market’s dream recipe! The delicious unique flavour of kohlrabi shines through and the yogurt-tahini sauce adds a delicious salty smoky flavour! I will sound extremely food-nerdy for this (fortunately this is a safe place for that) but I went to my first organic farmer’s market on Saturday and it was SO great! If you follow me on Instagram you would’ve seen my post – and I’m so amazed that so many different kinds of creations grow in Jamaica! I mean, of course you’re probably thinking you are a tropical country but unfortunately only a small portion of our culture actually eats from what we grow. Nevertheless, there was quite a lot to choose from at this fabulous farmer’s market, including vegan chocolate cake (cue me buying IMMEDIATELY), a tomato jam that Mr. Bakes and I SOMEHOW managed to finish between Saturday afternoon and as at the time I am writing this (Sunday night) – it was that good, a creamy cashew butter and an incredibly delicious pepper spread that we are certain contains some sort of pickled vegetable that we need need need to get on its own. I also picked up endless amounts of green blends – by endless I mean finishing by Wednesday because my brain has gone plant crazy – with mixtures of mustard greens, kale, and arugula and of course, tons and tons of straight kale. My eyes lit up when I saw the organic kale. Which I then ate half for dinner the same night. I would like to point out that as long as I don’t douse this in chocolate this is a pretty healthy obsession to have! I’m counting down the days until the next one in two weeks and prepare to see many plant-based recipes coming up. Nothing knew there! I’m sure you’re thinking “could you just get to what the heck Kohlrabi is?? ?” So while at the market, one of the farmer’s introduced Kohlrabi to us – this beautiful purple (and sometimes white) vegetable which is also known as a turnip cabbage. It’s so pretty to me and honestly, when the farmer said we should taste it raw first I was kind of not feeling that. However, after trying their arugula raw and loving it, I decided to give it a try. 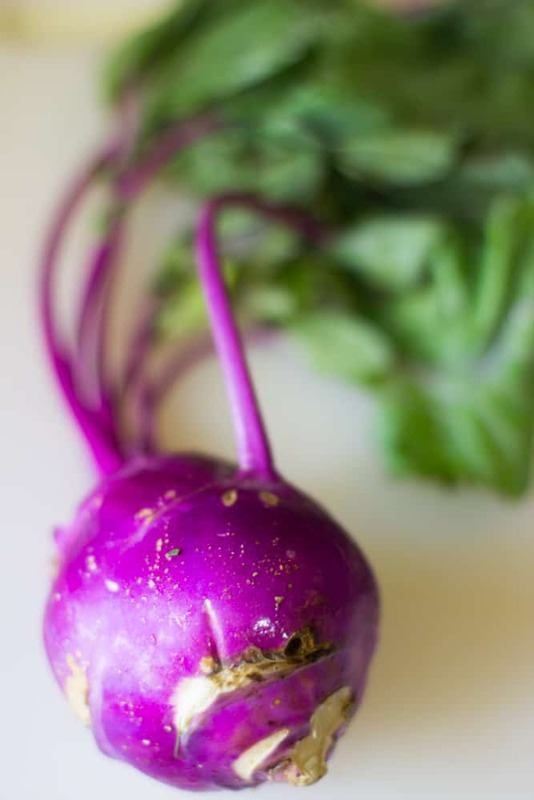 Kohlrabi is actually pretty delicious raw – it’s fresh with a slightly sweet taste, and I mean that wholeheartedly. Any articles online suggest trying it raw first. It would definitely taste perfect in a slaw (which Mr. Bakes suggested – cue annoyance that we only bought one!!) but fritters came to my mind immediately. There was a sweet potato in the house and well, it just seemed like it would work great together. After cooking the potato in the oven for about 25 minutes, adding a flax egg (guess who hadn’t gone to the supermarket yet!) and stirring in the kohlrabi, the fritters we were left with were soft, smelled amazing and divine. No really – we all know I have that problem of wanting to devour everything before shooting it but I really did have a fritter before even plating. 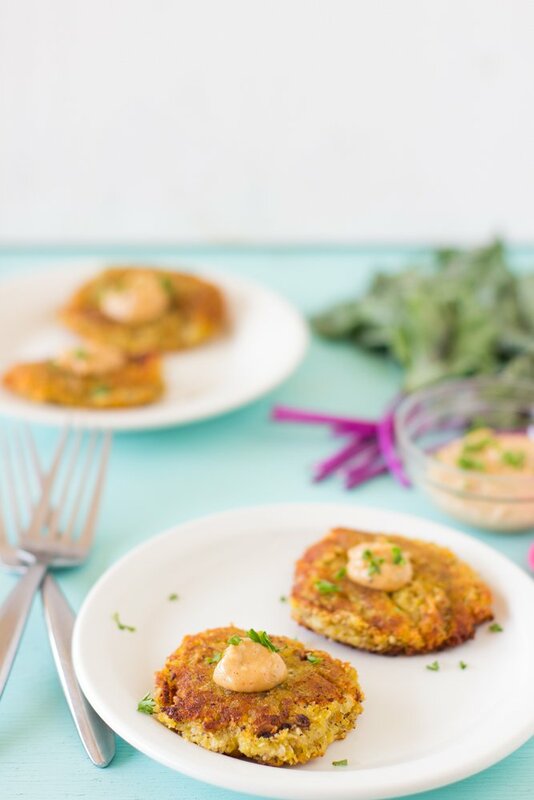 These kohlrabi fritters were had a crunchy flavourful exterior with a soft, wonderfully textured inside that would make you fall in love instantly. I thought it was great, and then I added the sauce. It went from an A recipe to an A++ recipe immediately, with the mix of sweet, salt, smoky and light all in one. Typically fritters taste oily and unhealthy but this actually didn’t – I think the base ingredients helped plus pan- frying only the tops in coconut oil. I would recommend this dish for any breakfast, lunch or dinner, since you know, I have no limit on what you can eat at any meal. I think I’ve chatted you out enough for now. GO run to your farmer’s market and try your local version of kohlrabi! I know you’ll love it. Mix all ingredients together with a whisk. Store in fridge until ready. Poke holes in the sweet potato with a fork and bake at 25 minutes until almost cooked through and much softer. Allow to cool and peel skin off. Cut the kohlrabi in half, and then peel kohlrabi's outer layer. Using a mandolin with a guard, julienne the kohlrabi until it resembles carrot sticks. In a food processor, mix in all the ingredients (except the coconut oil) including the flax egg and pulse slightly until combined (but not pureed together). Heat coconut oil in a large skillet over high heat. Whilst heating, form kohlrabi sweet potato mixture into fritter patties (I was able to make 6 fritters). Place in hot coconut and reduce heat to medium high, and cook on each side for 5 minutes until golden brown. They are delicate, so be careful not to break them. When cooked through, place on a paper towel in a plate to absorb excess oil. Serve with Yogurt-Tahini Sauce and top with chopped parsley (optional). Depending on the size of your sweet potato, you might need to chill the patties first for about 15-30 minutes, or use another flax egg if they aren’t holding together. Gorgeous photography as always Jessiker! These look divine! I tried kohlrabi raw for the first time ever last year! But besides then I didn’t know what to do with it! I’ll have to try this!! Aren’t farmers markets the best! I actually squealed with excitement yesterday at ours when I saw that my favorite farm was finally there with honeydew, cantaloupe, and watermelon. These fritters look awesome! Such a great side dish. And I’m totally in love with the yogurt tahini to spread on them! I have definitely heard of kohlrabi but have never tried it. It looks so beautiful in that picture! And I think I’d love anything drizzled with that fabulous sauce! That must have been so fun to go to an organic farmer’s market. I don’t think I’ve seen one in my area, though my local market does have a select variety of organic produce. 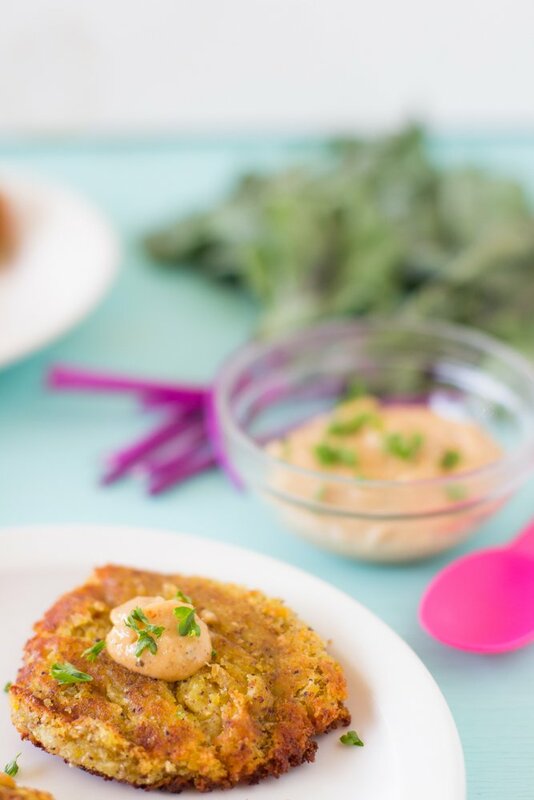 These sweet potato fritters look amazing! And I love that dipping sauce. Such a perfect combination! I can relate to feeling the excitement at the organic market. It’s like being a kid at a cant store. Lovely photos and fritters look delicious. those fritters look seriously delicious.. never used kohlrabi before! definitely something i need to try! OMG I love farmers markets! And I love the colour of this kohlrabi. I’ve actually never tried it because I’ve been intimidated/didn’t know how to prepare it. I wasn’t sure if you ate the bulb or leaves or both hehe. Gorgeous gorgeous recipe! I must make these immediately. The flavours going on here are really calling my name. And tahini? MY FAVE! I have never used this before, but I would love to after seeing this. I love farmers markets. We don’t have too many of them round here, but I try to go to them as much as possible. What a fun farmer’s market trip, and I love what you did with some of your finds! Kohlrabi is so delicious, but I’ve only had it in slaws. This sounds like a great way to use it — I love myself a good fritter, especially with sweet potato! Jessica, these fritters look amazing! I can’t wait to see what other fun farmer’s market recipes you come up with 🙂 I’ve never had kohlrabi before because I had no idea how to eat it but now I’m going to try making these fritters! Is there something else that you can substitute for the kohlrabi? I get so excited at farmer’s markets. I feel lie a kid in a candy store. My eyes light up at all the beautiful foods. 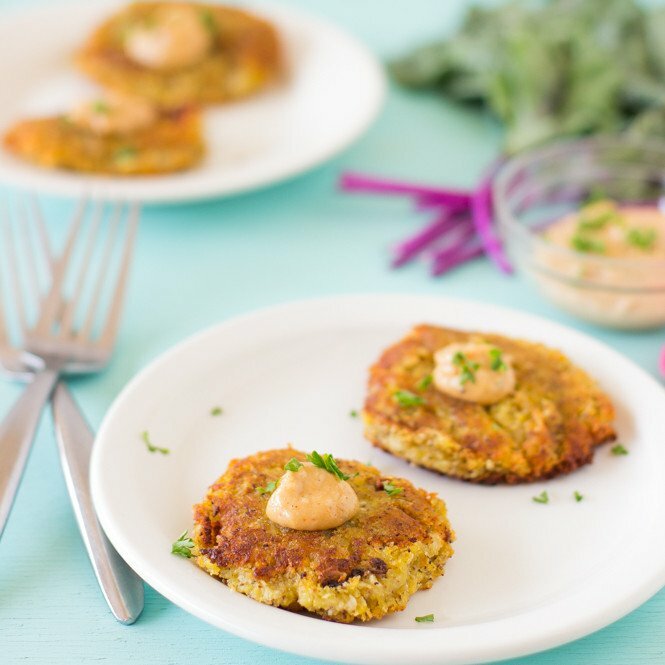 These fritters look delicious and that yogurt tahini sauce sounds amazing! These sound soooo sooooo good Jessica! LOVE it! I never tried it, but I am sure I would like it since I like turnips in my salad! YUM! These look so delicious! I get as excited about farmers markets as you do, so I can’t wait to see what you do with the spoils from your future trips! I would’ve had a hard time not buying everything at that market, Jessica! I’ve never tried kohlrabi (that I know of), but you’ve inspired me to seek it out. Those fritters look delicious, and so does that dipping sauce! Your delicious recipe has been nominated as one of the “Top 100 Best Potato Fritters Recipes on the Internet”. You can view it and vote for it here: http://potato-recipes.org/best-potato-recipes/best-potato-fritters-recipes-internet/ (position #85). How did you get yours to stay together? Mine fell apart even though I left them to cook for more than 5 minutes. Oh no! Honestly I didn’t do anything special, but this could definitely depend on your sweet potato size. If you find it’s falling apart after one, refrigerating them for a bit might help keep them together, or adding another flax egg. I really hope this helps Jamie! Thanks!! I will try that next time. Even though they didn’t stay together, they were really good! You’re so welcome Jamie and so happy you liked how it tasted!! you might want to revise to state combine all ingredients in the food processor EXCEPT for the coconut oil. The oil is used for frying, not to go into the mixture.